One of the most effective ways to bring two materials together are adhesive tapes. Adhesive tapes are available in a wide array of variants, and based on the type of material that needs to be taped, the best adhesive tape for the task will vary. The main reason behind that is the fact that different tapes have different properties that make them appropriate for some situations, while inappropriate for others. For instance, anaerobic adhesives provide protection against oxygen, heat and light; pressure sensitive adhesives are capable of strong bonds with the surface, and don’t require a lot of pressure to stick to it. And thermostat adhesives are very resistant to high temperatures. There’s a lot to say in favour of adhesive tapes, but here’s what makes them really popular. First and foremost, they can improve quality and performance. For instance, an adhesive cloth tape is very useful for electrical and plumbing work. Aluminium tapes offer immunity against heat. So when you compare tapes to other temporary alternatives, they pull ahead because they maintain the quality of the product while providing a durable bond. Surfaces joined by the right tape can be protected from vibration, cracks, corrosion and can resist extreme weather and provide flexibility to the parts that are conjoined. 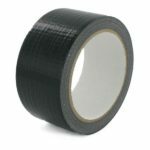 Secondly, when compared to other fixing alternatives, such as liquid adhesive and clips, tapes are much more efficient. Regardless whether it’s some fragile equipment or an irregular surface, tapes can help retain the authentic design and appeal of the product. You can join two very different materials relatively easy with adhesive tape. Moreover, tape requires less space than other adhesive solutions. Furthermore, they’re considered a very worthwhile investment, which provides returns in the long run. An expensive product that cannot be immediately replaced can be “fixed” with an adhesive tape. While the look of the product might be harmed in the process, with the right adhesive tape you’ll be able to prolong its life-span. Additionally, you don’t need any professional skills or much effort to tape something. You simply tape the parts together to see whether you can retain its functionality. If you’re looking for adhesive tapes, don’t forget to check the internet. You can literally find all types of tape online without putting too much effort, and have it delivered to your front door, regardless whether it’s adhesive cloth tape, foam tape, a double sided tape or anything in between.